Biomass gasification power systems have followed two divergent pathways, which are a function of the scale of operations. At sizes much less than 1MW, the preferred technology combination today is a moving bed gasifier and ICE combination, while at scales much larger than 10 MW, the combination is of a fluidized bed gasifier and a gas turbine. Larger scale units than 25 MW would justify the use of a combined cycle, as is the practice with natural gas fired gas turbine stations. In the future it is anticipated that extremely efficient gasification based power systems would be based on a combined cycle that incorporates a fuel cell, gas turbine and possibly a Rankine bottoming cycle. The most attractive means of utilising a biomass gasifier for power generation is to integrate the gasification process into a gas turbine combined cycle power plant. This will normally require a gasifier capable of producing a gas with heat content close to 19 MJ/Nm3. A close integration of the two parts of the plant can lead to significant efficiency gains. The gas from the gasifier must first be cleaned to remove impurities such as alkali metals that might damage the gas turbine. The clean gas is fed into the combustor of the gas turbine where it is burned, generating a flow of hot gas which drives the turbine, generating electricity. Hot exhaust gases from the turbine are then utilised to generate steam in a heat recovery steam generator. The steam drives a steam turbine, producing more power. 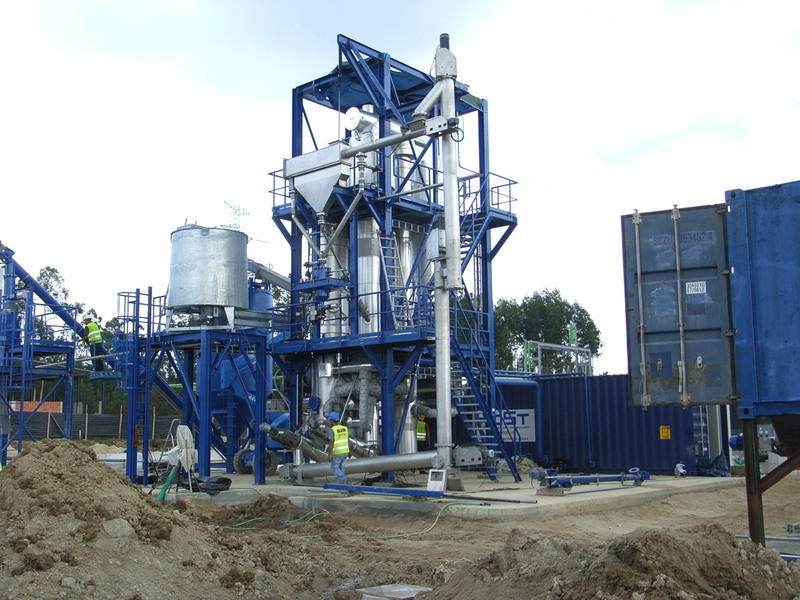 Low grade waste heat from the steam generator exhaust can be used within the plant, to dry the biomass fuel before it is fed into the gasifier or to preheat the fuel before entry into the gasifier reactor vessel. The gas-fired combined cycle power plant has become one of the most popular configurations for power generation in regions of the world where natural gas is available. The integration of a combined cycle power plant with a coal gasifier is now considered a potentially attractive means of burning coal cleanly in the future. Another potential use for the combustible gas from a biomass gasification plant is as fuel for a fuel cell power plant. Modern high temperature fuel cells are capable of operating with hydrogen, methane and carbon monoxide. Thus product gas from a biomass gasifier could become a suitable fuel. As with the integrated biomass gasification combined cycle plant, a fuel cell plant would offer high efficiency. A future high temperature fuel cell burning biomass might be able to achieve greater than 50% efficiency. Tagged Biomass Gasification Power Systems, Biomass Gasification Systems, Biomass Gasifiers, Coal, Combined Cycle Power Plant, fuel cell, Gas turbine, gasification, Hydrogen, Integrated Gasification Combined Cycle, power, Steam turbine, turbine. Bookmark the permalink. Lao serious of lacking cooking gas.